Fluid Service Technologies, Ltd. focuses on providing some of the simplest, most cost effective vehicle service equipment in the market today. 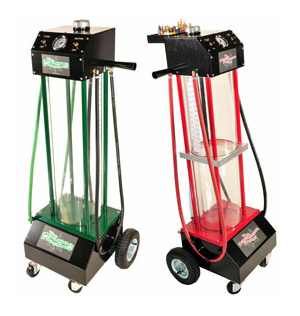 Using our extensive experience in the "Fast Lube" industry, our equipment designs meet the needs of today's fast paced service industry, while delivering continued performance to vehicle owners who use these services on a regular basis. Fluid Service Technologies (FST) manufactures category leading, specialty fluid service equipments (Transmission Flusher & Coolant Flusher) for the Fast Lube, independent Service and Automotive Dealership market worldwide. Our experts answer your questions about the fast lube industry as well as provide how-tos and best practices for flushing vehicles. FST is a preferred supplier to many of North America's leading service operations. Industry technicians have tested our products first hand and unanimously agree that our units, fittings, tools and accessories are the easiest to use in the industry. "We have used the Fluid Service Technology Transmission and Coolant flush machines exclusively in our service centers for more than 7 years. Don Weber, Oil Can Henry's International, Inc.